The Substation Residency, Dislocating the Studio, is a series of residencies featuring local and international cultural practitioners, structured as a challenge to the space of the studio/gallery. The Substation is located at the Wits School of Arts on East Campus. In October this year, artists Christopher Cozier and Luis Jacobs were invited into the studio space to work on projects and interact with the university and wider art community. 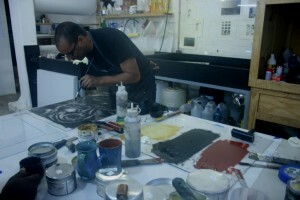 Trinidad-based artist, Christopher Cozier was also invited to make an edition of prints at David Krut Workshop at Arts on Main during his occupation of the studio space. 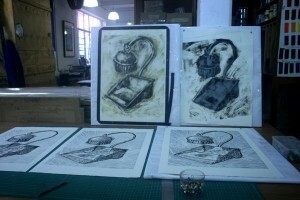 He created a series of monotypes and linocuts, called After All That Talk, featuring an antiquated table cleaner. 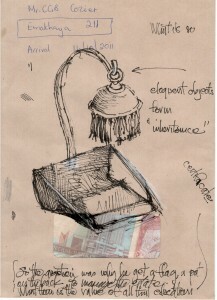 At first glance the object is completely foreign, bizarrely mistaken for what looks like an old fashioned lamp with tassels hanging over a dust pan. 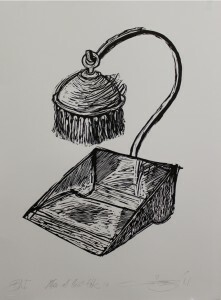 The object, consisting of a small receptacle with a handle and a brush, is in fact called a table crumber or a silent butler and was used for collecting ashes and crumbs. After Cozier’s great aunt recently passed away, he inherited the antique and has since been completely intrigued by the contraption. Since I was given this archaic object, I have been wondering about how education sometimes gives us the language to articulate and even the countenance to accept the random conditions created by those who simply have the money to do what they want? I think of the outrage being expressed by young people occupying various financial districts around the world. It is a device to brush crumbs from a table. I thought it would be interesting to use the lino cut and Century Schoolbook type with Creole – like grammar to make the unfamiliar object and the language fit. Cozier questions whether social and economic relationships are significantly altered as the net of globalisation widens. What defines the Caribbean, for Cozier, is that it is one of the earliest locations for the challenges of Modernity founded on genocide, forced transplanted labour and transnational treaties and trading arrangements devised by competing European Kingdoms since the 16th century. The “Silent Butler” as it’s called, which may represent the colonised, asks us where we sit: at the table or on the side. The name is transferred onto the people who are traditionally perceived to have no say. The Colonial past is then overlapped with the Global present; the mystery of the object referring to what is known and not known at the same time. He goes on to explain, “The object leads us more outwards to thoughts about the 99% movement and the young people occupying the various financial districts around the world.” The object has travelled across time and people are, in a way, still practising the silent protest by sitting down and occupying the financial districts in order to get their message across. In his work Cozier looks at how migration and alternate economies are responses to these challenges. Christopher Cozier’s work is often dealt with metaphorically through physical objects; a rubber stamp, a bench or a table crumber, for example. Personal experiences reappear in the form of the little objects he collects, spurring off random memories that contain within them something far deeper than what is suggested by the innocent, everyday items.